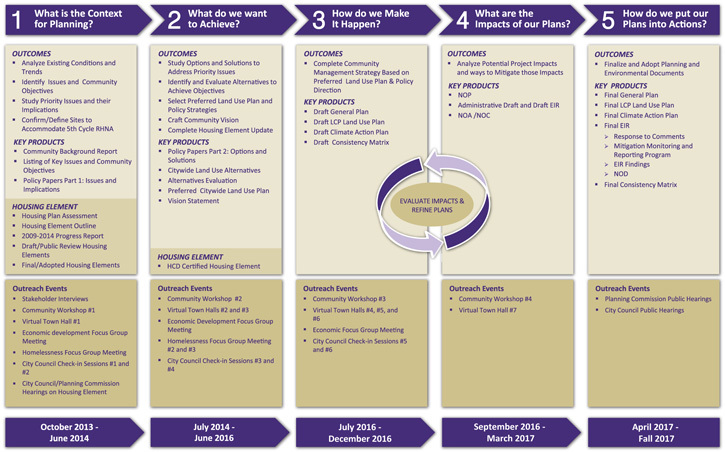 Eureka’s General Plan Update process was organized into five broad tasks. The status of where we are with each task is noted below. There will be opportunities for you to express your opinions and be heard during each task. These opportunities will include Community Workshops, Virtual Town Halls, City Council/Planning Commission study sessions, and other events held throughout the process. 5. How do we put our plans into action? We are here. Key outreach events included Stakeholder Interviews, Community Workshop #1, Virtual Town Hall #1, initial Focus Group Meetings, and City Council/Planning Commission Check‐in Sessions #1 and #2. Key outreach events included Community Workshop #2, Virtual Town Halls #2 and #3, Focus Group Meetings, City Council/Planning Commission Check‐in Sessions #3 and #4, and City Council/Planning Commission hearings on the Housing Element. Key outreach events included Community Workshop #3, Virtual Town Halls #4 and #5, Focus Group Meetings, and City Council/Planning Commission Check‐in Sessions #5 and #6. The EIR and General Plan were circulated for public review and comment. 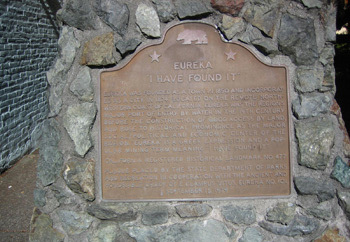 Key outreach events included City Council and Planning Commission public hearings.